Crafting the ultimate Facebook page is not something that can be done in minutes. It’s a process that takes time and energy, but most of all, it takes clever ways to engage and inspire your customers once they click the Like Button. 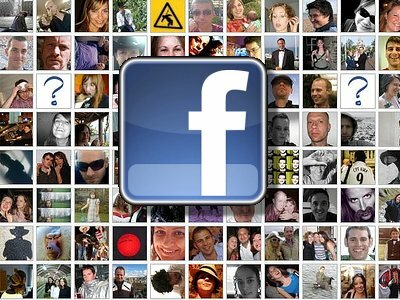 There are several companies that have been doing just that and their Facebook fans have soared. Zappos, Tiny Prints and Threadless have all found unique ways to successfully integrate social media into their marketing strategies. Let’s see what we can learn from each of them! 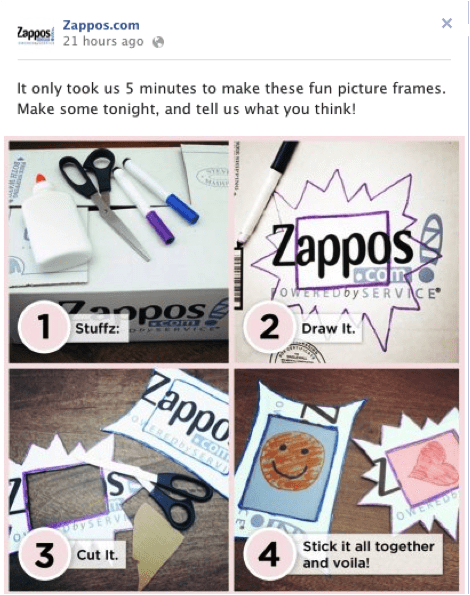 Zappos emphasizes company culture by promoting events, clever discussion posts as well as regular updates. With well over 200,000 fans, Zappos’ Aaron Magness, senior director of brand marketing for the company emphasizes that their popularity comes from having real conversations. They are believers in giveaways and contests. Zappos’ Facebook posts have a lively/fun tone which draws customers in with their positive vibes. They seem to set their fans into a frenzy with their good humor and fun disposition. Even on a rainy day, Zappos will have something good to say. It’s important to remember that the way your company communicates through Social Media, matters significantly. If your goal is to increase ROI, there’s no better way to do it than through great content inspiring conversations and engagement. Use Traditions. 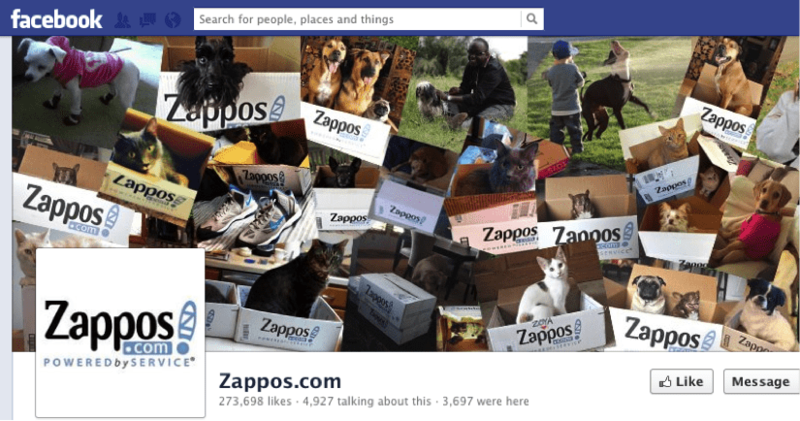 Zappos knows that taking advantage of the moment is key in successful Social Media Marketing. The goal is to appeal to a vast audience and to gain a significant following. What better way to do it than during the football season? Even if it’s not my preferred sport, it still makes me want to press on that “spare football”. Free Stuff. Zappos also created a tradition of establishing regular giveaway contests. Take for instance “Eye for Style”. This contest gives you the option to choose a custom outfit that has the chance to compete with the one they posted. If it’s voted for enough times, the user gets the chance to take the original outfit home. How cool is that! Give Instructions. You see these instructional 5-second Arts and Crafts on Pinterest, which is one of the reasons why people love it so much. The fact that you can achieve cool things in matter of seconds dumbfounds everyone I know. Zappos knows that. I might try this at home tonight. 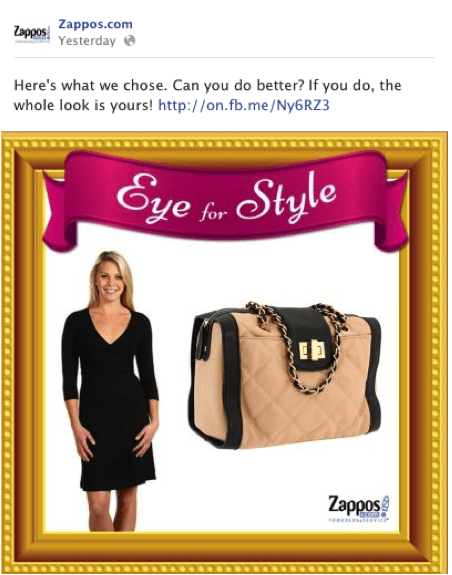 Whether it’s arts and crafts, tailgating or a fashion spread, Zappos aims at targeting users with varied interests. What do all these things have to do with shoes? Well, not much. It’s just interesting and fun. Often, that’s all the audience wants. Establish trust with your customers. Stay Engaged; follow up every conversation. Always keep trying, even if your photo has a few likes, don’t get discouraged. A loyal following is built over time. 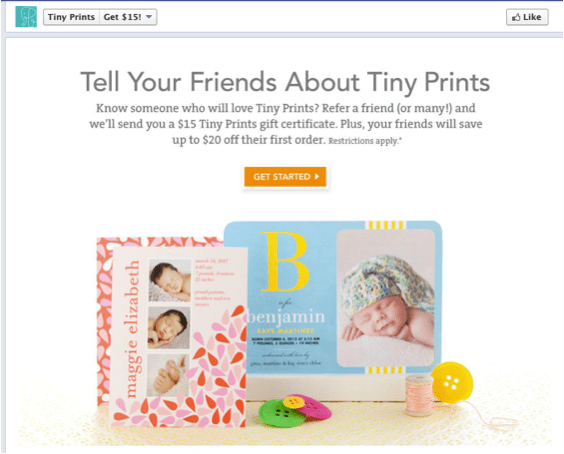 Tiny Prints has focused a significant amount of effort on developing Facebook offers for customers. Their Facebook page is an all-in-one deal that let’s clients receive exclusive offers and view products directly from the Facebook page. They also offer regular inspirational boards and party ideas for all tastes. 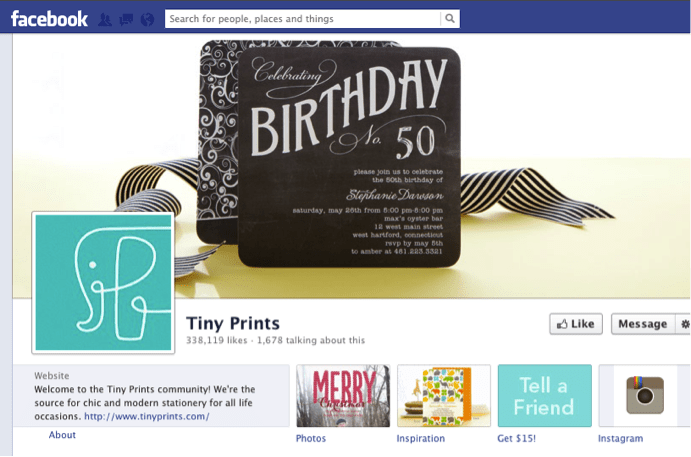 Tiny Prints started their Social Media Marketing in an effort to drive traffic to their website, but as they increased in popularity they reached about 64,000 fans on Facebook, building a community of loyal fans. According to Anna Fieler, marketing Vice president of the company, traffic on Facebook increased over 600% from 2009 to 2012. She also mentions that during holiday season, customers who were on Facebook more often spent more than customers who weren’t. Promote Offers. Facebook Offers is a recent feature that aims at helping companies with their Social Media following as well as to increase their ROI. Tiny Prints has taken the initiative to regularly promote offers on their Facebook page. If you haven’t done so already, get to it to maximize profits! Involve Your Community. A great way to expand your community and gain popularity is to include local students and universities in your Social Media strategy. 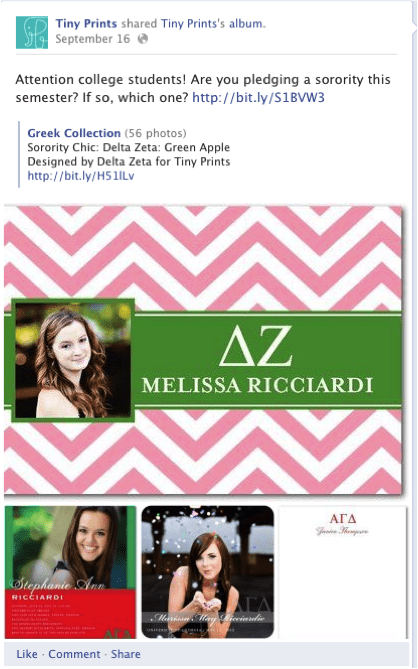 Take for example Tiny Print’s idea to involve sororities in their Greek Collection greeting cards. 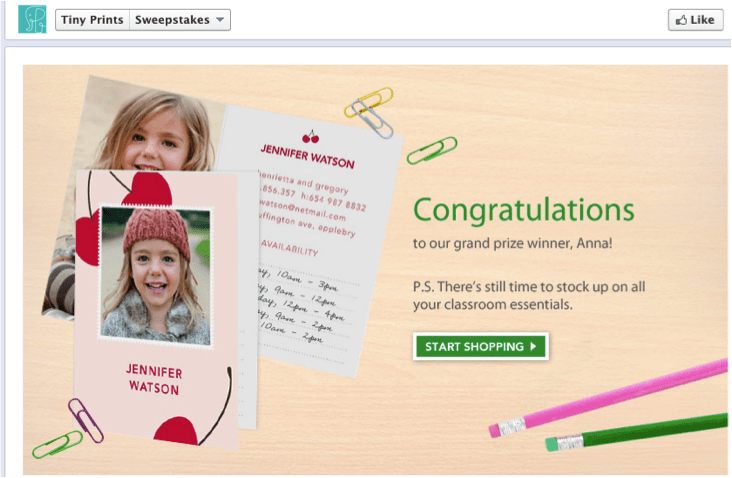 Use Sweepstakes and Recognize Winners. Who doesn’t love these? The key to a successful sweepstakes is to know your audience and craft it accordingly. Take for instance, Tiny Print’s example. This sweepstakes was obviously targeted to working parents. Hence, Tiny Prints took the opportunity to advertise their classroom essentials. Reach out to your community by finding ways to get involved. Maximize ROI with effective offers. Appeal visually to your audience. Know how and when to target your audience. 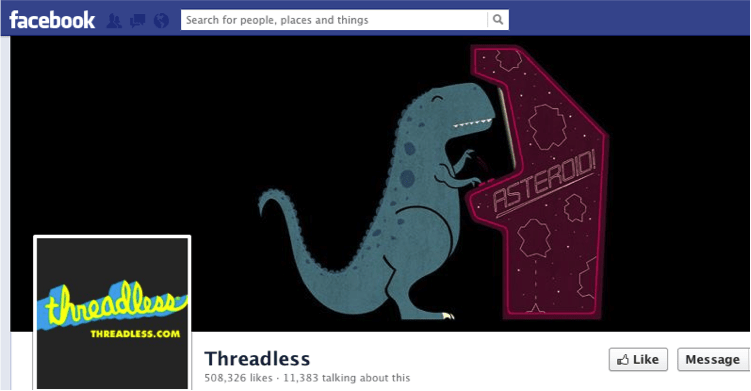 Threadless allows followers to post shirt designs, vote for their favorite clothing piece, and purchase products directly on Facebook. 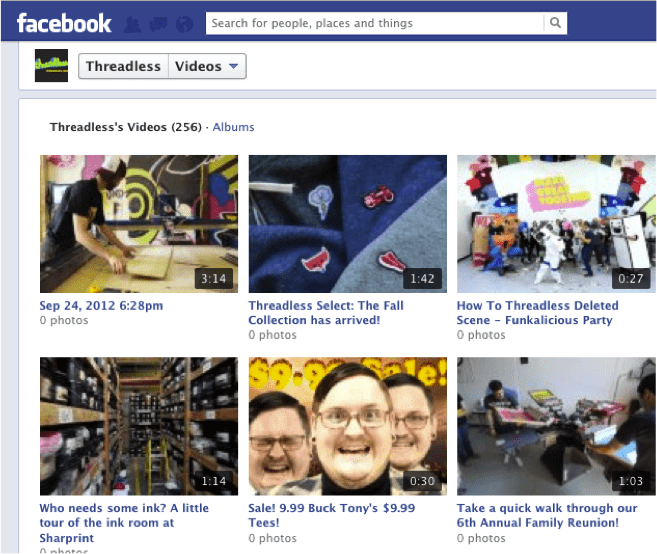 The amazing thing about Threadless (and the reason why they seem to be so popular on Facebook) is the fact that they focus on a significant amount of media such as videos as well as broadcasts meet-ups. The way Threadless works is somewhat different from other clothing lines. A network of skilled designers turns in their creations to the Threadless community in which these are voted for inclusion on the Threadless product line. In a way, Facebook acts as the fashion show before the final call. Facebook Shopping. Implementing Facebook e-commerce is a great way to increase your ROI through Social Media. 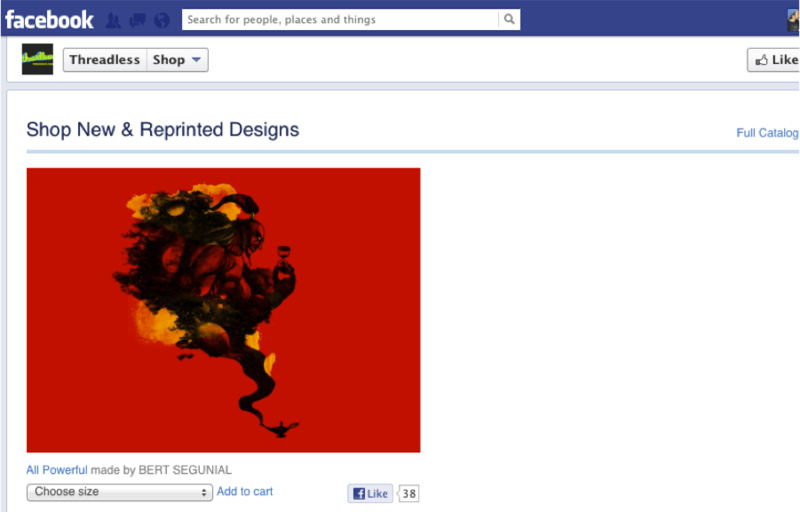 Take for instance, Threadless’s example of including their products directly on their Facebook page. This way, their Facebook fans save the step of visiting the website. It’s almost like having a second free webpage! Using Video. Video is blossoming as Marketing content and this is the time to start using it to your advantage. Threadless knows how important it is to share interesting media with your audience to increase your Social Media presence. Their videos feature previews of new collections, company events and catchy commercials. Promote Meet-Ups. 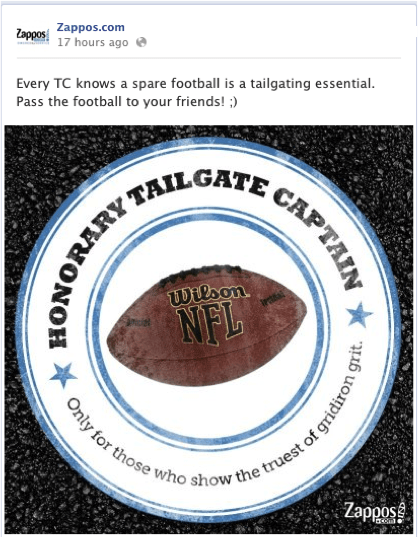 Not every company understands the importance of events in your Social Media efforts. It’s a great way to reach new customers and media attention. Whether it’s a networking event or a company party, there’s something about having a good time that makes people remember you after they leave the party. 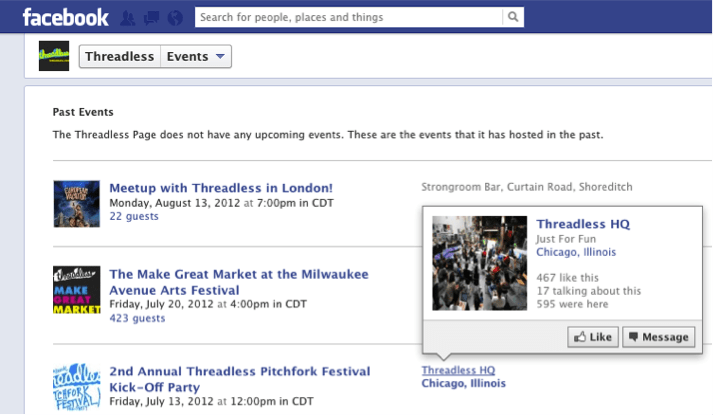 Promoting events on Facebook is a plus! From Zappos and Threadless to Tiny Prints, there are tons of companies that have found a way to make Facebook work for them. The keys understand your audience and what would interest them and get them to interact. Facebook’s new eCommerce option makes it simple to maximize your ROI and even easier for customers to view and purchase your merchandise. No matter what industry you reside in, utilizing social media doesn’t have to be something that you shy away from. It can be a cost-effective, easy and fun way to interact with your customers. For assistance establishing a social media strategy that increases engagement and conversions, contact Optimum7 today!